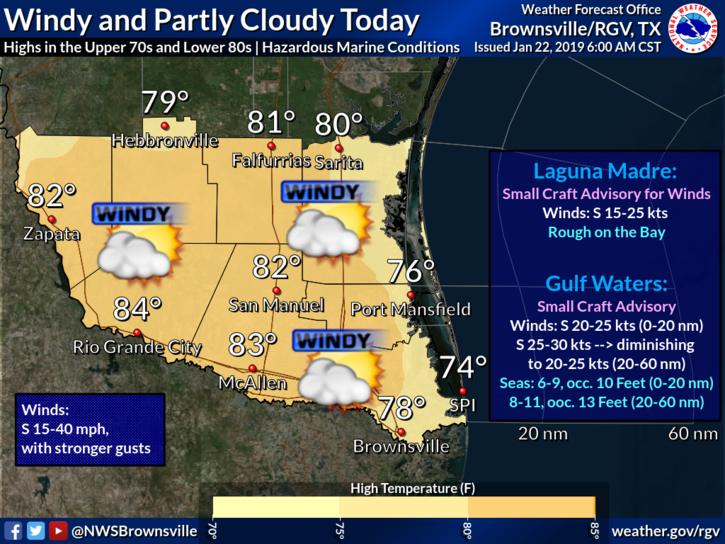 A Wind Advisory is in effect from 9 a.m. to 4 p.m. Tuesday for Willacy and Cameron counties, according to the National Weather Service in Brownsville. Winds are expected to be 25 to 35 mph with gusts up to 40 mph. Caution is advised for high profile vehicles, especially those traveling along east to west highways, such as Interstate 2, or elevated bridges and overpasses. The western portion of the Rio Grande Valley will see wind speeds between 15 to 30 mph. Along with the breezy conditions, expect partly cloudy skies with temperatures ranging from the upper 70s to lower 80s. Rio Grande City will see a high of 84 while McAllen will reach 83. The high in Brownsville will be 78. South Padre Island is expected to reach 74.